Old Fitzroy Theatre 18 – 29 November. Currently playing at The Old Fitzroy Theatre is Angelika Fremd’s monologue Belle of the Cross, performed by Gertrude Ingeborg and directed by David Ritchie. Belle of the Cross is a beautifully poetic homage to people Fremd has seen and met living on the streets in the King Cross area. It’s a dignified homage to the courage, strenght and beauty of these people, something that we don’t necessarily see so easily as we glance in their direction through our busy lives. I was lucky enough to distract Gertrude with a small series of questions about the character of Belle, and what playing such a role has meant to her. Lisa – What initially attracted you to the idea of playing Belle? Gertrude – I’ve worked on a script with Angelika Fremd before and I do like her writing very much. Also, I’ve always had a strong feeling for the homeless – what must it be like to live on the street, how did they end up where they are now, where had they been before. But also a fear – could this happen to me as well? Playing this part takes me out of my own comfort zone, it is a character part which is so much more enjoyable to play – and normally I wouldn’t be cast in such a part, except for people who do know me better. Lisa – How is Belle part of the Kings Cross cultural fabric? Gertrude – Well, she’s uniquely Australian because she does live in Kings Cross, names the streets she walks about, refers to places that are only found in this area, like The Piccolo or The Chapel for the homeless. But other than that she could be a homeless person anywhere, who face the same problems and difficulties. Lisa – How do you find a form inside of a character like this, that accommodates the enormity of a life so visually immediately and yet so culturally subverted and practically ignored? Gertrude – All you have to do is use your imagination, absorb the words that have been written for this character and look around you. I live in Woolloomooloo which harbors many homeless people, in parks, under the railway and around the supermarket, right next to a police station. Lisa – What is “love” for Belle, do you think? Gertrude – Love is what she feels and receives from her ‘sisters, brothers, and friends’ on the street. The other ‘love’ – I think she’s buried this one quite some time ago. Lisa – What do you love about Angelika Fremd’s words and David Ritchie’s direction? Gertrude – Angelika knows what she’s writing about because she’s lived at the Cross herself for 8 years. Her writing is very poetic, and she has a strong feeling for the rhythms of the language, it is like a piece of music once you can read ‘the notes’! I’ve worked with David Ritchie on many, many productions in the past. His directions are always very precise. You can argue with him when you don’t agree with something without getting into trouble – well, not quite, but you can still do it He keeps things very simple, there are no unnecessary props or movements and he is always very encouraging and doesn’t always tell you what or how to do it – you can try your own version first and when that doesn’t work he’ll change it. I just trust him and therefore I feel safe when I step out onto the stage. Lisa – Please tell us anything else you’d like us to know about Belle of the Cross. 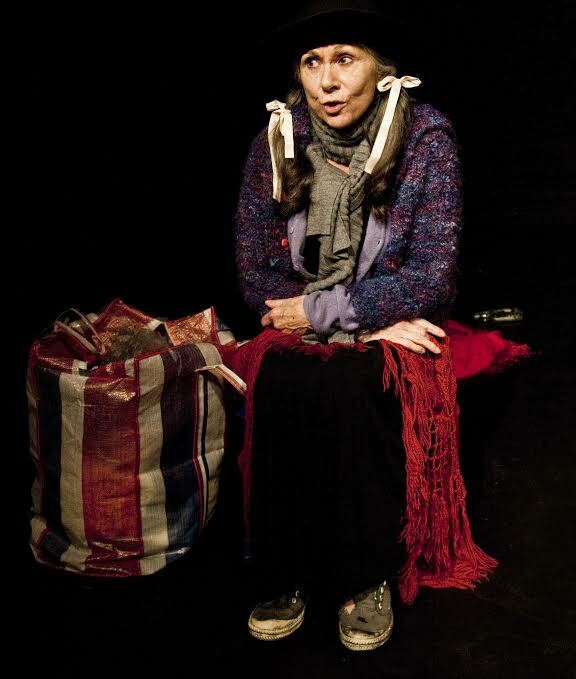 Gertrude – Although it deals with ‘homelessness’ Belle is not a depressing play. She doesn’t blame anybody, she doesn’t complain just gives us in inkling what it must be like living on the streets and how she copes with it and how she probably got there and why. Belle also recites some poems, one by Angelika Fremd and one by Ken Slesser, both are very lovely.